If you want to defeat climate deniers, the first thing you need to know, without a shadow of a doubt, is that global warming is, in fact, happening. I already know that -- I'd like to think we all do, deep down -- but there are people who continue to insist that the data is wrong. That's why, after a week spent learning why climate deniers insist that human activity isn't responsible for the rise in global temperatures, the second week of online class at Denial101x was dedicated to understanding how we know what we know: that temperatures are increasing, sea level is rising and glaciers are melting. And yes, those basic facts remain true even when it's snowing outside. The lessons this week were rooted in the cold (er, warm), hard science, from a tidy takedown of the global warming "pause" to a neat explainer on the difference between climate and weather (though I'm partial to Neil deGrasse Tyson's take on that one). It also explored, in depth, why we can feel confident in trusting temperature records. The data, when laid out in front of you, is difficult to dispute. But the University of York's Kevin Cowtan, who delivered several of this week's lectures, raised an important point in an additional piece of commentary: talking about climate science involves a lot more than holding up graphs and saying, "So there!" That, he explained, would merely be "fighting unskeptical thinking with more unskeptical thinking" -- a true skeptic, he said, would ask questions, and be able to explain why the graphs brandished as "proof" by climate deniers look different from the graphs proving that climate change is happening. -Sea level rise is one of the clearest indicators of warming that we have, and it all comes down to simple physics. 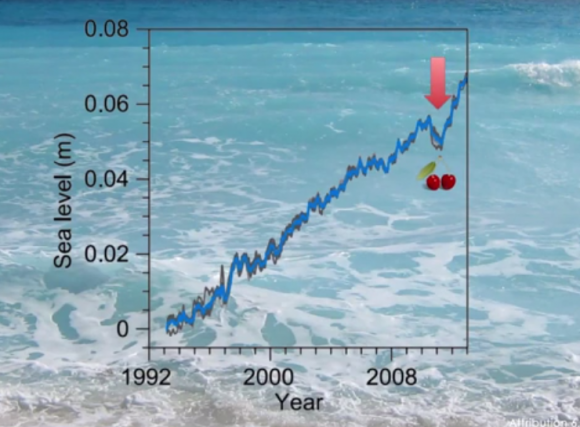 Lecturer Keah Schuenemann, a professor of meteorology at the Metropolitan State University of Denver, explains that there are multiple factors causing oceans to swell, one of the most obvious being that warming water expands. Knowing as we do that the oceans are absorbing more than 90 percent of the excess heat being trapped in the atmosphere, it makes sense that sea levels have already risen by about 20 cm (8 inches) since 1880, and are expected to get even higher. The melting ice sheets, of course, are contributing to that rise as well. So how do climate deniers find "proof" that the seas are the same as they've always been? They rely on cherry-picking: zeroing in on the year 2010, for example, when there was an excessive amount of rainfall and flooding. All that water was delayed from draining back into the ocean, and sea levels temporarily dipped. What a climate denier who talks about this won't show you is the long-term trend -- or, for that matter, that fact that sea levels rebounded the next year. -The glaciers are melting. Again, we have clear data documenting that. But, explains Robert Way, a PhD candidate in physical geography at the University of Ottawa, there isn't always a direct relationship between a warming climate and melting glaciers. Warming air, after all, hold more moisture. So if the winter air in an area warms, but remains below freezing, there may actually be an increase in snowfall, which in turn can cause a glacier to grow. Warmer summer temperatures, and thus increased melting, should cancel that out, but it isn't always the case. Way points out that our planet has a lot of glaciers -- over 100,000 of them. So if you really wanted to, you could totally find a few that are getting bigger. However, you'd be cherry-picking. -Listen to climate deniers long enough, and you'll hear them shout out the accusation that scientists have been tampering with temperature data. Well, they have been -- sort of. Scientists sometimes have to adjust weather station readings, explains Cowtan, if there's been a change in the station's location, the instruments being used or other operating practices. But they don't just guess: they use observations from other nearby stations to reconcile the data. And the adjustments, in any case, they make only a tiny difference to the temperature record. Climate deniers who suggest these adjustments are the real reason for data documenting global warming are guilty of jumping to conclusions -- another common fallacy. I'm going to be away next week. Fortunately, taking class online means there's always an opportunity to catch-up, so I'll be back two weeks from now with more updates from class. In the meantime, why not enroll for yourself?